Read here about flat tensegrity structures that are deployed vertically, perpendicular to the ground, and can function as walls. A wall is a structure that encloses or divides an area. Typical walls are vertical and flat, or planar. There are three principal types of structural walls: building walls, exterior boundary walls, and retaining walls. There are also separation walls, shared walls, portable walls or movable partitions, etc. A tensegrity wall is a tensegrity structure composed of a repeating tensegrity module, that outlines the shape of a wall. Since a tensegrity is formed mostly of empty space, a more proper term for these structures might be a sheet or skin wrapping a tensegrity structure. 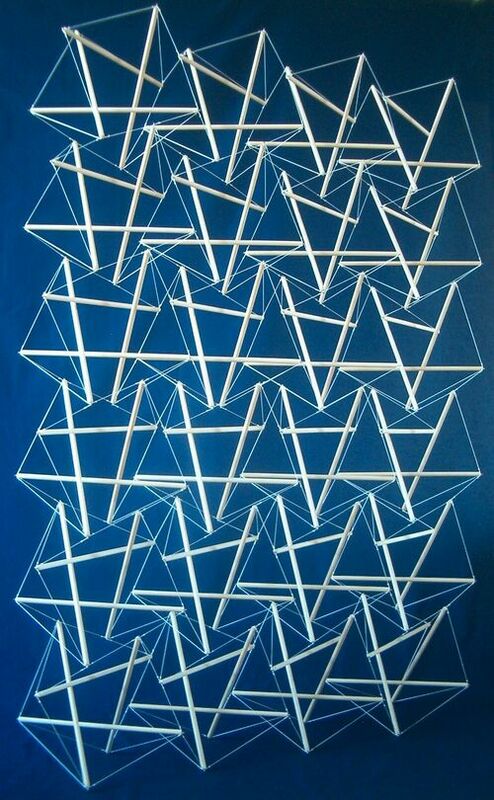 Pars took a 4 strut unit and repeated it 24 times to create a tensegrity wall. He then removed 12 of these modules (48 struts) and curled the wall into a ball. This is another reason that the term "sheet" is preferably to wall, as a sheet or surface is often deformed in such ways, while a wall is a compression, rigid structure that cracks when deformed. 4 strut unit repeated 24 times by Pars. Andrew Payne in October 2007 developed an actuated tensegrity wall in 3D MAX and posted it online. He wrote, "After a long time coming, I finally decided to continue my research on actuated tensegrity systems. I had already created a fully rigged tensegrity module whose compression member's rotation was driven by the distance from the apex of the system to the midpoint. This distance was wired to a slider in the 3D Max file, so the user can easily drive the system by the use of one simple device. However, to complicate matters a little bit, I decided it would be more interesting to rig these modules up into a system, or a wall type structure where all the modules were connected and thus getting more displacement out of the design. Through a little more math and a lot more time, I was able to create a 4x4 wall system that is fully controlled by the same slider that controls the vertical movement of an actuator inserted in the middle of each module (which would ultimately control the distance from the apex to the midpoint). This system could be configured to work with a sensor so that the structure could change shape according to various environmental stimuli." The Actuated Wall by Payne inspired Zach Kron, Architectural Designer and Software Analyst for Autodesk, to implement the same structure using Revit massing and paneling tools. He then rebuilt it in May 2009. This page was last edited on 28 November 2018, at 18:30.